Are your tired of an unwanted wrecked car occupying unnecessary space in your garage? Have you got any plan about what to do with it? Well, if not then why don’t you give us a call? 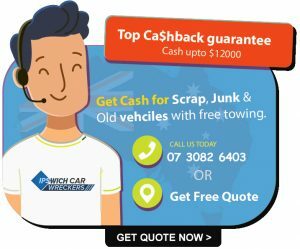 Cash For Cars in Ipswich is a dedicated and reputed company to provide quality cash for car services in Ipswich Queensland area. Our company has been dealing in such cars since a long time now. We buy all types of cars without any hesitation or hassle. It is better to get some value in exchange for the piece of junk in your garage rather than throwing it into the junkyard. Our cash for car service in Ipswich is open to all in the entire Ipswich area. You can get a sum of $13,999 from us if your car really worth it. More than 20 years of experience enabled us to provide the exact service that people demand from us. One of the common problems faced by almost every wrecked car owner is finding a reputed company that deals in all types of cars. Most of the dealers only deal in some specific type of car models and make. But, our company has widened its approach to make it easy for the people. We do not confine our clients with any specific models and makes. Our company deals in all types of car models like cars, vans, trucks, buses, 4wd’s, 4×4’s and Utes. We deal in all types of car irrespective of their condition like old, scrap, smashed, junk, damaged, accidental vehicles. Our company covers all areas of Ipswich and its suburb areas. So, no matter where you live, just call us anytime you want. Some of the popular brands that we often deal in are BMW Used Cars Ford Junk Cars, Holden Unwanted Cars, Honda Scrap Cars, Hyundai Accidental Cars, Kia Old Cars, Mazda Broken Cars, Mitsubishi Used Cars, Nissan Wasted Cars, Subaru Second hand Cars, Toyota Scrap Cars, and Volkswagen Used Cars. We Pay for any condition car removals Ipswich. What Amount Can that be Paid? How much cash you’ll get for your car or truck!!! Even if registration is expired less than one year. 1999 – 2000 and still registered. Or registration expired. Value $500 -$8000. Getting Cash From $2000 to $13999 onwards for luxury and commercial vehicles. Please call us to view can be worth up to $9000 complete condition apply. To Getting, Trucks are worth even more so if you have any unwanted trucks call us first. When it comes to the cash for car services, our company Ipswich Car Wreckers has unique and flexible dealing procedure. You are going to get each and every service in one place. As soon as you will call us, our professionals will be at your doorstep within few minutes of your calling. So, there is no need to worry about traveling anywhere. Our expert technicians will analyze all the features of your car and give you the best possible value of it. If you agree to all the terms and price rate then you have to sign a contract with us. After that, we promise to pay you on the spot. Our removal service and working mechanism. Once the deal is finalized then the car will be removed from your property free of cost. Yes, you have heard it right. You don’t have to pay a single penny for the removal of your wrecked car. We will carry the car back to our workshop for further processing. Once the car reaches our workshop, we dismantle all the useful parts and sell it for further use in other cars. The rest of the metal part is crushed and sold to a metal recycling company for making further appliances. We Pay– Cash For Junk Cars Ipswich, Cash For Junk Cars, Cash For Old Cars, Cash For Used Cars, Top Cash For Mercedes, Cash For Toyota Ipswich, Cash For Mazda Ipswich, Cash For Honda Ipswich, Cash For Holden Ipswich, Cash Ford Ipswich, Cash for Suzuki Ipswich and Jeeps. If you want any kind of help for us, feel free to give us a call today. You can also email us at info@ipswichcarwreckers.com.au and we will be in touch with you as soon as possible. We will also provide you with a free estimation of your car. Just fill the form present on our website for it.